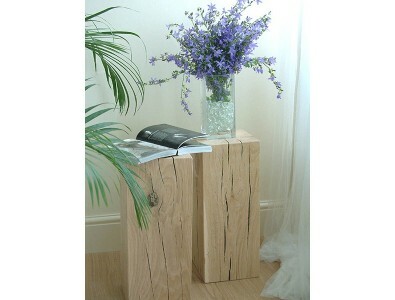 Here we offer a range of solid oak side tables or lamp tables, in the form of our solid oak blocks. Available in 2 heights 16" (40cm) or 20" (50cm) and in the case of the set of 3 oak blocks there is also a smaller 12" (30cm) size. As with all of our solid oak coffee tables, we offer a choice of 3 colours to match. Only solid green oak or semi air dried oak from sustainable sources is used for any side table, all of which have a rustic appearance with cracks and splits. These are an intentional part of the oak furniture and only add to the character of the pieces. Each piece is individual. We have recently added a shabby chic white oak side table to our range to compliment rustic oak bedroom furniture that customers may already own. Light natural solid oak side table hand-made from European or American oak by our own craftsmen. Available in singles or pairs and also either 16" (40cm) or 20" (50cm) heights. Natural wax finish. Oak lamp table hand-made from solid European or American oak by our own craftsmen. Available in singles or pairs and also either 16" (40cm) or 20" (50cm) heights. Dark oak lamp table. Wax finish. 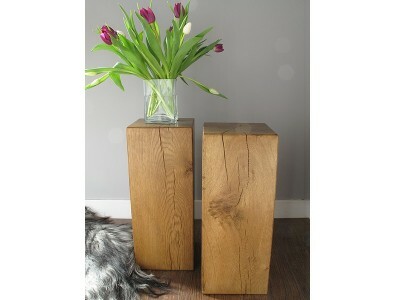 Set of 3 medium oak block lamp tables or oak side tables, 1 each of 50cm, 40cm and 30cm heights (20", 16" & 12") approx. Medium solid oak side tables hand-made from European or American oak by our own craftsmen. Available in singles or pairs and also either 16" (40cm) or 20" (50cm) heights. The perfect oak bedside table. Set of 3 light oak block lamp tables or side tables, 1 each of 50cm, 40cm and 30cm heights (20", 16" & 12") approx. White, distressed, oak lamp or side tables hand-made by ourselves with a shabby chic look. Available in singles or pairs and also either 16" (40cm) or 20" (50cm) heights.